3-bedroom, ground floor apartment with in a new contemporary development built to the highest standards close to the charming coastal town of Estepona. The private garden and layout of this unit will make you feel like you live in a villa and it offers plenty of privacy and views over the surrounding gardens. With an innovative design to ensure a flow of natural light and an fully fitted, modern kitchen integrated into the open plan living and dining areas opening up to the outdoor area by floor to ceiling windows and glass doors. All the rooms are spacious and private and have a luxurious feel with fitted wardrobes, porcelain tile flooring, hot and cold air-conditioning, a separate laundry room plus private parking and a storage room included. The pool area is inviting and located in the center of the community making it a natural meeting point for socializing and relaxing, a private Spa with a pool, a jacuzzi and a gym will be available. 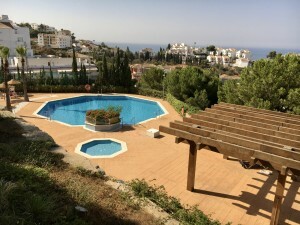 With walking distance to tapas bars, restaurants and a 9-hole golf course plus only a short drive to the beach, Puerto Banus and Estepona center, this is an ideal location for a holiday home or an investment.